Greetings of peace and blessing from URI-Africa. The retreat was organized by the African Union (AU), in collaboration with the African Centre for the Constructive Resolution of Disputes (ACCORD). The meeting brought together the AU Panel of the Wise, AU Special Envoys and High-Level Representatives, the Council of Elders of the Economic Community of West African States (ECOWAS), the Mediation Reference Group and the Panel of Elders of the Southern African Development Community (SADC), and the Committee of Elders of the Common Market for Eastern and Southern Africa (COMESA). 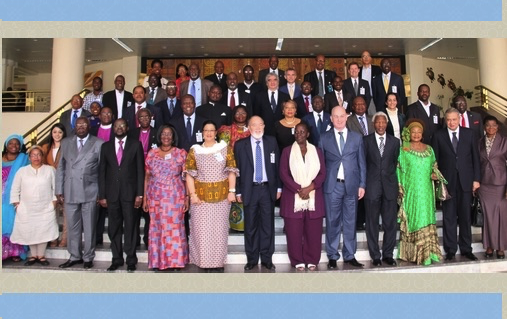 The Intergovernmental Authority for Development’s (IGAD) Mediation Contact Group as well as the secretariats of the Economic Community of Central African States (ECCAS), the East African Community (EAC), Union of Maghreb States (UMA) and the Community of Sahel-Saharan States (CENSAD) participated in the Retreat. In line with the mandate and spirit of PanWise, African national mediators, individual mediators and institutions engaged in mediation activities at national and sub-national levels (such as national ombudsmen, local councils of elders, pastoralist mediators, from groups including the African Insider Mediators Platform – AIMP, and women and youth representatives, among others) also participated in the retreat. The Retreat was organized in accordance with the decision of the Assembly of the Union of 26 May 2013 to establish the Pan-African Network of the Wise (PanWise), which is a continental network of individuals, mechanisms and institutions committed to conflict prevention and mediation. Such engagements are encouraged to promote the functional inclusion of “bottom-up approaches” to mediation in continental and regional mediation efforts, create opportunity for collaboration on joint activities, cement partnerships, and expand the ownership of the African Peace and Security Architecture (APSA) to the African people. 4. Discussing the wide variety of customary and contemporary mediation approaches and the implications that differences in approach have for effective mediation practices. 6. Developing a plan of action for joint initiatives and activities with the Luanda Biennale for a Culture of Peace in Africa/Pan-African Forum for a Culture of Peace in Africa, such as the development of National Programmes for a Culture of Peace.